After having invited Gilbert Artman the last two years as drummer with Catalogue we’re very delighted to have him back with his own legendary group Lard Free, for a first concert in more than 30 years, with original members!! 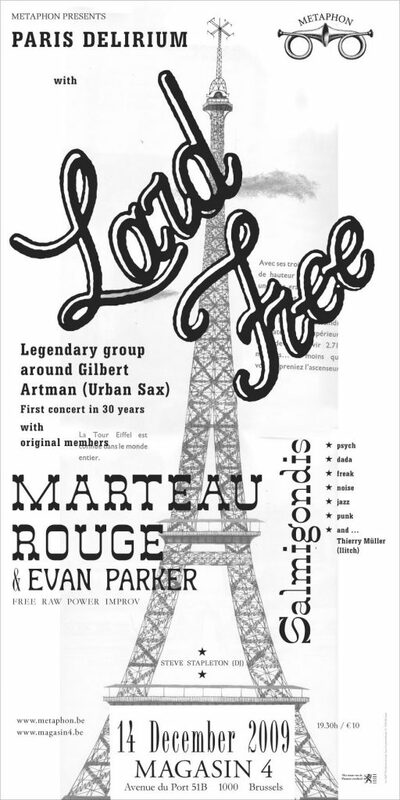 Since the early 70’s Lard Free became one of the leading French underground ‘free rock’ groups formed by Gilbert Artman, once drummer with Don Cherry and Steve Lacy, and mostly known as mastermind behind Urban Sax since the late 70’s. Lard Free emerged from the experimental jazz rock scene developing a unique style combining the repetitive progressive rhythm section, pulsating electronic sequences and free acid psych with damaged guitar outbursts. Another remarkable feature in most of the Lard Free work is the use of vibes often evoking the ’round about midnight’ feel. Their untitled 1973 debut album has it all including the mindblowing gatefold cover, a true landmark in the French alternative rock scene. The equally great 2nd album including Richard Pinhas on guitar is more spacey and electronic. The group did many concerts in France till 1977 when their 3rd album ‘Spirale Malax’ came out, a seriously surreal krautrock artefact. Afterwards Artman mainly focussed on the mighty Urban Sax that toured all over the world. Throughout the 70’s and 80’s he was also involved in other highly acclaimed French groups like Komintern, Clearlight, Heldon, Catalogue, Vidéo Aventures. The trio Marteau Rouge got formed about 10 years ago by French guitar centipede Jean-François Pauvros, also known from Catalogue and numerous other collaborations. In Marteau Rouge Pauvros is joined by vintage synthesizer wizard and prolific soundengineer Jean-Marc Foussat (cfr great LP ‘Abattages’ from 1983) and by Japanese drummer Makoto Sato, also living in Paris. The group delivers some kind of heavy expressionistic electroacoustic free improvisation as spontaneous as a red hammer. They also regularly work with guest musicians as Joe McPhee or Keiji Haino and mostly with English free improvisation colossus Evan Parker who will also be the guest for this concert. To be expected is dynamic set of burning free style tension where tumultous explosions will be altered by sparce textural episodes. Salmigondis is a Parisian sextet of musicians with different backgrounds that took shape in 2006. On the menu is an explosive stew of psych, dada, freak, noise, jazz, punk and other spices. According to the mood, place, energy, technical provisions the group impulsively reflects its influences with acoustic, electric and electronic sounds all driven by an irresistible urge. The result could be placed along the work of The Nihilist Spasm Band, Smegma or the No Neck Blues Band. Salmigondis released some delicious slices of vinyl on their own label Bloc Thyristors along with other family dishes as Tankj and Empan. Metaphon co-production with Magasin 4.